POINTE.INFO is an alternate website of LifePointe Church in Kansas City/Olathe (Kansas). POINTE.INFO was created specifically to maximize our attender's experiences on Sunday mornings. Our original site, MYLIFEPOINTE.COM, is designed specifically for new visitors. While MYLIFEPOINTE.COM serves as an overview, POINTE.INFO serves as a central place to learn the functional heart of our church. On POINTE.INFO you will find eConnect Cards, Sermon Notes, Church News (Events), as well as registration forms and support resources. If you are new to LifePointe we invite you to visit POINTE.INFO. I hope everyone is staying warm in this beautiful snow! Due to the 10" we are forecasted to end with we are cancelling tonight's (Saturday) Red Ink Revival. We are going to have church tomorrow for anyone who can make it in, and all of those who want to watch online. 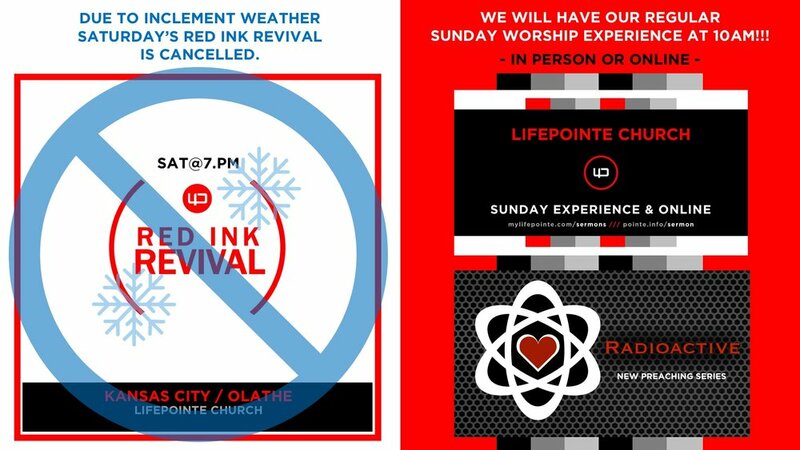 We plan to have a FirePit (Red Ink Revival Sunday Night) at 6PM as the snow and road threat should be gone by then. 2019 is a year of FUN! Be encouraged to live fully in each moment, whether at church or home. I miss the Red Ink Revival, but I'm "owning" my moment and loving God's grace where ever I am. AND, I'm having fun in God's pleasures. This fast may not be stereo typical, but it is uniquely amazing. I'm praying for you to be filled with might by His spirit in your inner man! BTW, I am stoked about RADIOACTIVE! !